The “Firefighter” is the simple solution for fire rated ceilings, that requires a maximum of 3 hours fire resistance. 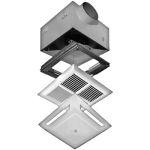 The “Firefighter” radiation damper and fan housing combination features the lowest height assembly in the industry. The REVERSOMATIC ceiling fan, with built-in Fire Radiation Damper, offers the best protection against flame penetration and radiant heat.